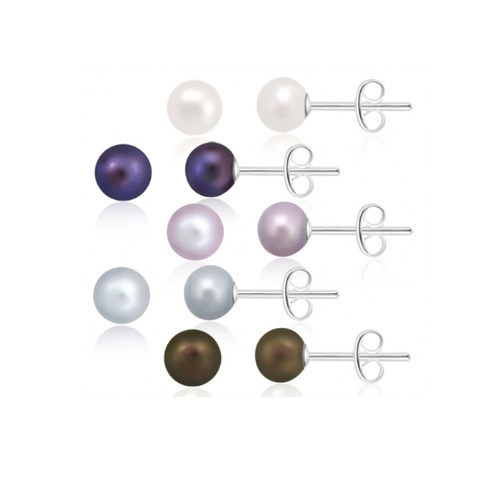 Freshwater Pearl 3 Pc Set Reg $95 Now $13 Shipped! 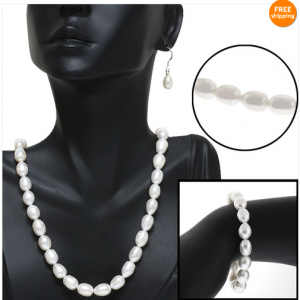 This is a fabulous deal on a Genuine Freshwater White Pearl Necklace Bracelet & Earring Set ! The set regularly retails for $94.99, but you can grab it right now for only $12.99 with free shipping. 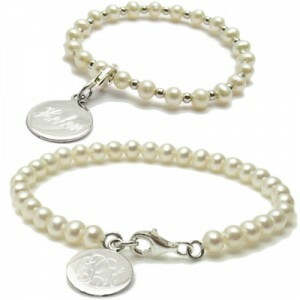 I think these gorgeous potato style freshwater pearl pieces would be perfect for Easter or as a Mother’s Day gift. 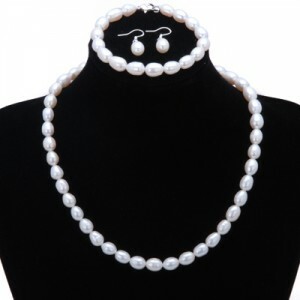 3 Pc Cultured Pearl Set Just $10 Shipped! 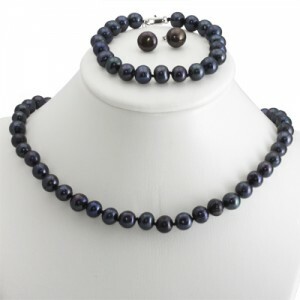 I am really wanting this black three piece set of Genuine 8-9mm Freshwater Cultured Pearl Necklace Bracelet & Earrings ! The set is regularly priced at $99.99 but you can grab the set in your choice of black, natural cream or peachy pink for just $9.99 with free shipping. I think they would also make a perfect gift for someone special and Valentine’s Day will be here before we know it! Freshwater Pearl Necklace Bracelet & Earrings $10 Shipped! 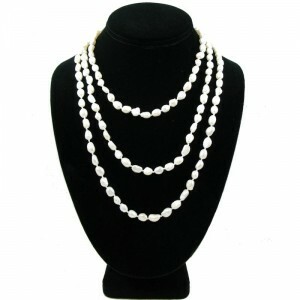 This is a fabulous deal on an 8-9mm Freshwater Cultured Potato Pearls Necklace, Bracelet & Earring Set . 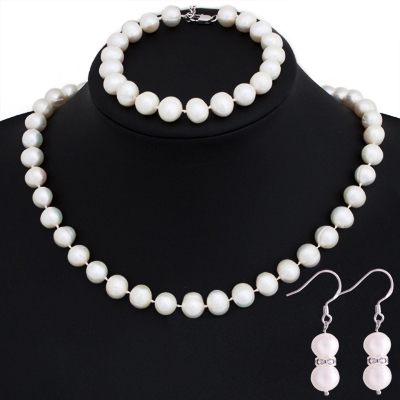 The three piece set retails for $119 but you can grab the set in your choice of natural cream white or pink pearls for just $9.99 plus FREE shipping! That’s a steal and would make a great gift for someone special this holiday season. 5 Pair of Pearl Earrings Reg $50 Now $10 Shipped! 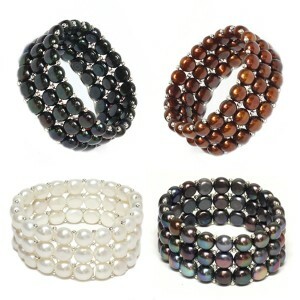 Freshwater Pearl 3 Row Bangle Bracelet $17 Shipped! Freshwater Pearl 3 Pc Set $11 Shipped! This beautiful Freshwater Pearl 3 Piece Set includes 8-9 mm cultured pearl necklace, bracelet and earrings for just $10.99 with free shipping! The set comes in a gift box and would make a great present for yourself or someone else. I think this 6.5-7.5mm Cultured Freshwater Pearl Gold Jewelry Set is just gorgeous and it’s so hard to find deals on real gold jewelry that isn’t plated with the price of gold these days! 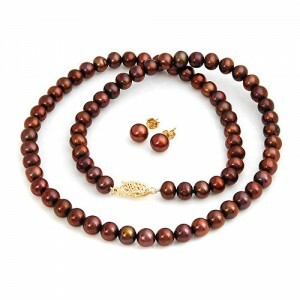 These beautiful brown freshwater pearls have 10K gold findings and you get the 18″ necklace and earrings on deal of the day for just $34.99 with free shipping.